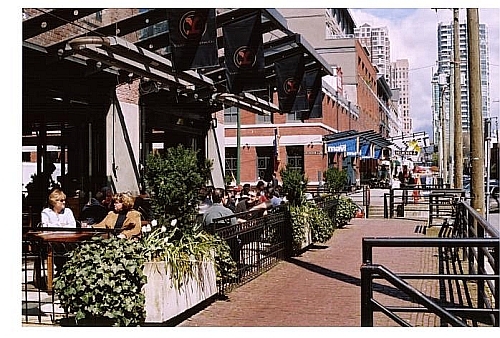 Free Talk-Patio « Vancouver Spotlight – Your Station! Your Stories! Novus TV is out in the summer sunshine to talk to the people on the street about their favourite summer patio spot, whether to have a cold one, or pick up that summer crush. First we discover people’s locals, some of the favourites being the Watermark, the Cactus Club in Yaletown, Global, Cardero’s, the Chili House, Section Three, Provence Marinaside, the Bluewater, Goldfish… anything that happens to be in Yaletown with a view of the water, or just with a good spot to people watch. Well, if pick-up line aren’t for you, if you’re taken and already have a beautiful pair of eyes to stare into, or if you’re just out for some good food and good times, Vancouver seems to know where its at. If someone in this clip catches your eye, pay close attention to their local and maybe you’ll see him or her there and you can try out your own cool moves. This entry was written by vanspotlight and posted on November 15, 2008 at 1:37 am and filed under Discussion, Nightlife, Outdoor Activities, Vancouver Restaurants with tags crush, flirt, free talk, free talk-patio, line, outdoor, patio, pick-up, romance, waterfront, yaletown. Bookmark the permalink. Follow any comments here with the RSS feed for this post. Post a comment or leave a trackback: Trackback URL.